The Prince Edward Viaduct System, commonly referred to as the Bloor Viaduct, is the name of a truss arch bridge system in Toronto, Ontario, Canada, that connects Bloor Street East, on the west side of the system, with Danforth Avenue on the east. The system includes the Rosedale Valley phase (a smaller structure, referred to as the Rosedale Valley Bridge, carrying Bloor Street over the Rosedale Ravine) and the Sherbourne Phase, an embankment built to extend Bloor Street East to the Rosedale Ravine from Sherbourne Street. The Don Valley phase of the system, the most recognizable, spans the Don River Valley, crossing over (from west to east) the Bayview Avenue Extension, the Don River, and the Don Valley Parkway. The roadway has five lanes (three eastbound and two westbound) with a bicycle lane in each direction. The subway level connects Broadview Station in the east with Castle Frank and Sherbourne Stations to the west. 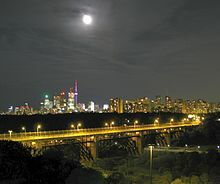 Designed by Edmund W. Burke, the Prince Edward Viaduct is a three hinged concrete-steel arch bridge with a total span of 494 metres (1,620 feet), at 40 metres (131 feet) above the Don Valley. The bridge consists of a deck made of transverse beams and I-girders, which transfer load to column supports. The column supports then transfer the load to the trusses within the arches, which transfer the load to the arches themselves. Finally, the arches transfer their load through large hinges to a concrete pier and eventually to the ground. Steel was provided by Dominion Bridge Company. In addition to the Don River, the Don Valley Parkway, and Bayview Avenue, two railway lines, an electrical transmission line and a bicycle trail all pass under the bridge spans. Referenda on the construction of the Prince Edward Viaduct were held in Toronto in every year from 1910 to 1913, with residents voting against its construction in 1912 by 59 votes and in favour in 1913 by 9236 votes. The projected cost of its construction increased from CA$759,000 in 1910 to CA$2.5 million in 1913; its final cost was CA$2,480,349.05 ($37.2 million in 2018 dollars). Upon its completion in 1918, it was named for Prince Edward, Prince of Wales (later King Edward VIII). The viaduct was designed to facilitate mass transit; its upper deck accommodated streetcars, while both the Don Valley phase and the Rosedale Valley phase included a lower deck for rail transport, controversial at the time because of its high additional cost. The bridge's designer and the commissioner of public works, R.C. Harris, were able to have their way and the lower deck eventually proved to save millions of dollars when the Toronto Transit Commission's Bloor–Danforth subway opened in 1966. The Rosedale Valley phase was not used for the subway, as the curve between each phase, as well as the curve to the west at Parliament Street, was considered too sharp for the subway. For this reason, a separate concrete bridge was built over the Rosedale Valley, just west of Castle Frank station. The Prince Edward Viaduct resulted in more rapid development of those portions of Toronto lying on the east side of the Don Valley. Over time, the Prince Edward Viaduct became a magnet for suicide, falling bodies posing risk to the traffic underneath. With nearly 500 suicides by 2003, the viaduct ranked as the second most fatal standing structure in North America, after the Golden Gate Bridge in San Francisco. At its peak in 1997, the suicide rate averaged one person every 22 days. In 1957, a child also climbed onto the railing and fell accidentally while walking along it. The suicides and safety risks prompted the construction of a barrier in 2003, though it was first approved by Toronto City Council in 1998 and delayed because of concerns about funding; during that time, the viaduct was the site of an estimated 48 to 60 suicides. The council originally approved a CA$2.5 million budget. However, the minimum bid for construction was CA$5.5 million. Council eventually endorsed a fundraising campaign to raise the remainder of the money. Construction was completed in 2003 at the cost of CA$5.5 million, with CA$2.5 million coming from taxpayers. The barrier was called the Luminous Veil. Designed by architect Dereck Revington and engineers at Halcrow Yolles and completed in 2003, the Luminous Veil consists of over 9,000 steel rods, 12.7 cm (5.0 in) apart and five metres (16 ft) high, stretched to cantilevered girders. The tensile structure was difficult to analyze and required several tests at the University of Toronto. Initially, cost prohibited the planned lighting to be installed on the top horizontal member. The lighting installation was completed in July 2015. The Luminous Veil received in 1999 a Canadian Architect Award of Excellence. A 2010 study found that though the barrier prevented suicide attempts from the Viaduct, overall rates of suicide by jumping for the city of Toronto have not changed since its construction. During construction of the barrier in 2002 a man opted to jump off from the Leaside Bridge and others have opted to jump in front of subway trains instead. Degrassi Junior High episode titled "Dog Days"
^ "Toronto Prepares For A Million People, Carries All Bylaws, Bloor Street Viaduct Will Be Built". Toronto World. January 2, 1913. p. 1. ^ a b Ritter, John (January 31, 2005). "Suicides tarnish the Golden Gate". usatoday30.usatoday.com. Tysons Corner, VA: Gannett. ISSN 0734-7456. Archived from the original on March 17, 2014. Retrieved March 16, 2014. North America's No. 2 suicide draw, Toronto's Prince Edward Viaduct, built a multimillion-dollar barrier in 2003 after more than 400 suicides. ^ "Tumbles From Viaduct, Boy Hits Mud, Unhurt". Globe and Mail. June 3, 1957. p. 1. ^ Do barriers around bridges prevent suicides? ^ "Suicide prevention barrier". Canadian Architect. Business Information Group. August 2001. Archived from the original on October 22, 2006. Retrieved March 16, 2014. 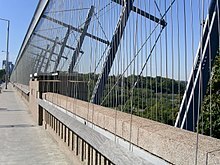 ^ Bridge Barrier Fails to Lower Toronto's Suicide Rate: Suicide-by-jumping rate at Bloor Street Viaduct lower; rates at other bridges higher, HealthDay News, July 7, 2010. Retrieved from ModernMedicine.com's website, July 2, 2013. Wikimedia Commons has media related to Prince Edward Viaduct.